There are many different types of hardwood floors and finishes make sure to find which is best for your needs. This page can help you with this decision, and find a few other flooring considerations here as well. Hardwood floors provide a lifetime of natural beauty and durability second to none. And like any other quality home addition, hardwood floors add resale value to your home. Hardwood floors are also more affordable than most floor types over the long term. They are easier to maintain, good for the environment, and excellent for allergy sufferers. 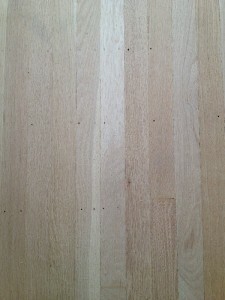 First, select either a prefinished wood floor or a floor finished on-site. When a floor is finished on-site, it’s carefully sanded and stained/coated in stages after installation and make take another day or two sometimes before it can be walked on. Prefinished floors do have the time advantage but may limit you to the type of finish you finally obtain. The finish may not look the same in your home as it did in a showroom so be sure to bring a sample home if possible. Prefinished flooring is sanded and sprayed at the factory. A durable aluminum oxide coating is applied which will withstand years of use, but is difficult to touch up. Prefinished floor boards have beveled edges; one of the signatures of a prefinished floor installation. On-site sanded/finished floors are often a more flexible choice for installation. Hardwoods are made up of individual boards in different sizes and species typically in oak, maple, ash, hickory, walnut, cherry and even some exotic woods. They come in either 3/4 inch tongue and groove or 5/16 inch top-nailed. Many classic older homes in Upstate NY and Rochester have 5/16 inch oak hardwood floors top-nailed every six inches (looking like dots in rows) and often applied over top of a tongue and grove sub base floor running parallel in the opposite direction of the floor joist. A common characteristic of these older floors so beloved by so many homeowners and even sought after by home buyers is the “creaking” noises when walked on. A 3/4 inch tongue and groove floor board are nailed in from the side. The row covers the nails. At most, a few nails may be visible near the edge of the wall. A great floor comes from great craftsmanship. Don’t settle for the lowest bidding contractor that comes along for the simple fact that you often get what you pay for. If you want a long-lasting floor installed correctly the first time, you will want a professional with will over 20 years of experience of doing nothing but hardwood flooring. This professional will first evaluate your traffic conditions, sub flooring condition, heating, cooling and humidity factors and overall spacing requirements before installation is even considered. Without these considerations, the proper floor choice can be easily be the wrong choice and disaster is looming. Give us a call at 585-750-0490 or send us an email for a free quote today!